Eklipse, a new Division II corps from Hopkinsville, Ky., played on borrowed instruments this evening, including Sousaphones -- the corps' bell-front tubas just arrived at their offices today. But despite the instrument setback, the corps sounded great for a first outing. Drum major Monty Brenemen, 21, of Paducah, Ky., said, "I was really excited! We only had a couple of camps during the winter, and a lot of people didn't think we could do it, but we made it through." 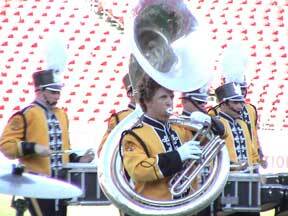 Regarding the borrowed instruments, Brenemen said, "We made the best of it." Brenemen also elaborated on the corps' 2003 show, and his favorite segment. "I like the ballad. A lot of the fans seemed to like it too. The performers really liked it, and they were really into it," Brenemen said.